Melbourne musical comedy duo “ElbowSkin” started entertaining crowds in their high school days in Eltham, circa 1997. 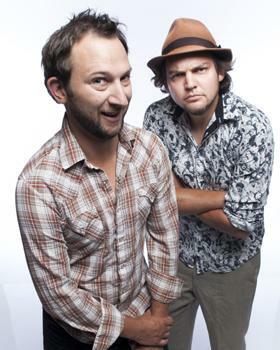 Dave Elbow and Ernie Skin: Melbourne's beloved musical comedy duo, ElbowSkin, have had audiences all around the world in stitches with their cheeky songs and hilarious sketches since 2003. Festival appearances include The Melbourne International Comedy Festival, Adelaide Fringe Festival and Edinburgh Fringe Festival as well as numerous appearances on Channel 7's AFL Game Day & the 2010 AFL Grand Final Breakfast. They have also custom written songs for many clients including the Australian Sommeliers Association, Fosters and Wolfblass.